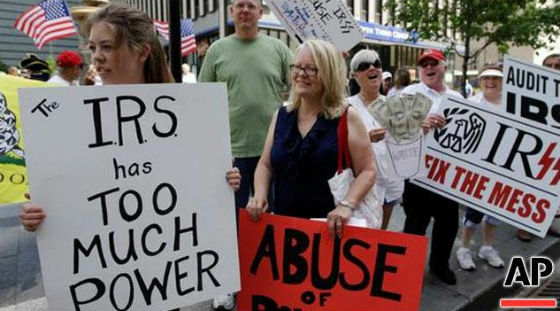 Our friends at Judicial Watch today released a new batch of Internal Revenue Service (IRS) documents revealing that IRS handling of Tea Party applications was directed out of the agency’s headquarters in Washington, DC. The documents also show extensive pressure on the IRS by Senator Carl Levin (D-MI) to shut down conservative-leaning tax-exempt organizations. The IRS’ emails by Lois Lerner detail her misleading explanations to investigators about the targeting of Tea Party organizations and appear to strongly contradict the long-discredited storyline that "low level" employees were responsible for the targeting of Tea Party and other conservative tax exempt organizations. The documents came in response to an October 2013 Judicial Watch Freedom of Information Act (FOIA) lawsuit filed after the agency refused to respond to four FOIA requests dating back to May 2013 (Judicial Watch, Inc. v. Internal Revenue Service (No. 1:13-cv-01559)). Because the BOLO only contained a brief reference to "Organizations involved with the Tea Party movement applying for exemption under 501(c)(3) and 501(c)(4)" in June 2011, the EO Determinations manager asked the manager of the screening group, John Shafer [IRS Cincinnati field office manager], what criteria were being used to label cases as "tea party " cases. ("Do the applications specify/state ' tea party'? If not, how do we know applicant is involved with the tea party movement?") The screening group manager asked his employees how they were applying the BOLO's short –hand reference to "tea party." His employees responded that they were including organizations meeting any of the following criteria as falling within the BOLO's reference to "tea party" organizations: "1. 'Tea Party', 'Patriots' or '9/12 Project' is referenced in the case file. 2. Issues include government spending, government debt and taxes. 3. Educate the public through advocacy/legislative activities to make America a better place to live. 4. Statements in the case file that are critical of the how the country is being run..."
So, we believe we have provided information that shows that no one in EO "developed" the criteria. Rather, staff used their own interpretations of the brief reference to "organizations involved with the Tea Party movement," which was what was on the BOLO list. Lerner omits that her office was “developing” the applications for all Tea Party groups. September 27, 2012: Levin asks for copies of the answers to IRS exemption application question 15 – a question about planned political expenditures – from four specific groups: Crossroads Grassroots Policy Strategies, Priorities USA, Americans for Prosperity, and Patriot Majority USA. October 17, 2012: Miller informs Levin, “As discussed in our previous responses dated June 4, 2012, and August 24, 2012, the IRS cannot legally disclose whether the organizations on your list have applied for tax exemptions unless and until such application is approved.” Miller, however, then informs Levin that Americans for Prosperity and Patriot Majority have been approved, but the IRS has no records for Crossroads and Priorities USA. October 23, 2012: Levin writes to again express his dissatisfaction with the IRS handling of “social welfare” (501(c)(4) organizations insisting that IRS guidance “misinterprets the law” by allowing any political activity. He again demands an answer as to whether the four organizations he listed in his previous letter were primarily engaged in the promotion of social welfare. He also seeks copies of tax exempt revocation letters sent due to c4 political activities, as well as statistics on how many c4s have been notified that they may be in violation due to political activities. A May 14, 2013, Treasury Inspector General for Tax Administration (TIGTA) report revealed that the IRS had singled out groups with conservative-sounding terms such as “patriot” and “Tea Party” in their titles when applying for tax-exempt status. The TIGTA probe determined that “Early in Calendar Year 2010, the IRS began using inappropriate criteria to identify organizations applying for tax-exempt status (e.g., lists of past and future donors).” The illegal IRS reviews continued for more than 18 months and “delayed processing of targeted groups applications” preparing for the 2012 presidential election. In mid-April, Judicial Watch released a batch of IRS documents (produced earlier in this litigation) revealing that Lerner had communicated with the Department of Justice about whether it was possible to criminally prosecute certain tax-exempt entities.